IupLua is a cross-platform kit for creating GUI applications in Lua. There are particularly powerful facilities for getting user input that don't require complicated coding, so it is particularly good for utility scripts. Attributes are an important concept in IUP. You set and get them just like table fields, but they are different from fields in several crucial ways. First, case is not significant, SIZE is just as good as size (but try to be consistent!). Second, writing to a non-existent attribute will not give you an error, so proof-read carefully. Third, writing to an attribute often causes some action; e.g the visible attribute of controls can be used to hide them. It is best to think of them as a special kind of function call. All the examples presented here and some utilities can be found at the "misc" folder in the IupLua examples. Using this dialog, you can enter as many lines as you like, and press OK. 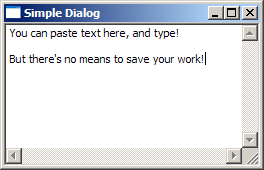 This has two advantages over plain GetText; you can give a prompt line, and you can press Enter after entering text. The %s code requires some explanation. Although you might at first think it is a C-style formating code, as you would use in string.format, it actually describes how the value is going to edited; %s here merely means that a regular text box is used; if you had used %m, then a multiline edit box (like that used by iup.GetText) would be used. Note the |item1|item2|...| list after the %l format; these are the choices presented to the user. The initial value you give it, and the value you receive from it, are going to be an index into this list of choices. Somewhat confusingly, they start at 0 (which is not the Lua way!) So in this case, 0 means that 'Teacher' is to be selected, and if I then selected 'Engineer', the resulting value of prof would be 2. The %i code allows you to enter an integer value, with up/down arrows for incrementing/decrementing the value. if res ~= 0 then    -- the user cooperated! A multiline edit control is created, and put inside a window frame with a given size, which is then made visible with the show method. We then enter the main loop of the application with MainLoop, which will only finish when the window is closed. It's good to pause a moment to look at the resulting application in action; it is fully responsive and you can enter text, paste, etc. into the edit control. Common keyboard shortcuts like Ctrl+V and Ctrl+C work as expected. All this functionality comes with the windowing system you are currently using. On my system, Task Manager shows that this program uses 3.8 Meg of memory, and an instance of Notepad uses 3.3 Meg, which represents all the common code necessary to support a simple GUI application; you are not actually paying much for using IupLua at all. The equivalent C program using the Windows API would be about 150 lines, so the gain in programmer efficiency is tremendous! This is perfectly responsive, although not very useful! The button sizes itself to its natural size since expand is not set (try setting expand to see the button fill the whole window frame.) Callbacks usually return the special value iup.DEFAULT, although in IupLua this is not really necessary. A useful way to present various views to a user is to put them in tabs. This places each control in a separate page, accessible through the tabbar at the top. Notice in this example that the titles of the tab pages are actually set as attributes of the pages through tabtitle. This is not one of the standard IUP controls (see Controls/Additional in the manual) so we also need to bring in the iupluacontrols library. After a timer has been started by setting its run attribute to "YES", it will continue to call action_cb using the given time in milliseconds. Notice that it is important to set the timer going only after the callback has been defined. It is perfectly permissable to switch a timer off in the callback, which is how you can perform a single action after waiting for some time. It is a well-known fact that computers spend most of the time doing very little, waiting for incredibly slow humans to type something new. However, when a computer is actually doing intense processing, users become impatient if not told about progress. If you do your lengthy processing directly, then the windows of the application become unresponsive. The proper way to organize such work is to do it when the system is idle. IupLua provides a gauge control which is intended to show progress; this little program shows that even when the computer is almost completely preoccupied doing work, it is still keeping the user informed and in fact the window remains useable, although a little slow to respond. So v is 1 if we are selecting an item, 0 if we are deselecting it; i is the one-based index in the list, and t is the actual string value. If you want to associate some other data with each value, then all you need to do is keep a table of that data and look it up using the index i. Note that this does not mean that a list object is a table. In particular, you have to explicitly set the end of the list of elements by setting a nil value just after the end. The most flexible way to present a hierarchy of information is a tree. A tree has a single root, and several branches. Each of these branches may have leaves, and other branches. All of these are called nodes. Thinking of a family tree, a node may have child nodes, which all share the same parent node. This example begins with the branches 'collapsed', and you will have to explicitly expand them with a mouse click. By default, trees are presented in their fully expanded form; try taking out the fourth line that sets the addexpanded attribute of the tree object. Note that branches can be empty! You will see that iselect is 0 for the unselection operation, and 1 for selection; id is a tree node index. These indices are always in order of appearance in a tree, starting at 0 for the root node. The name attribute of the tree object is the text of the currently selected node. A pair of useful callbacks are branchopencb and branchclosecb. If you were displaying a potentially very large tree (like your computer's filesystem) then it would be inefficient to create the whole tree at once, especially considering that you would normally be only interested in a small part of that tree. Trapping branchopencb allows you to add child nodes to your selected node before it is expanded. executeleafcb is called when you double-click on a leaf, as if you were running a program in a file explorer. You will get the top level branches of the tree; notice that they are specified in reverse order, since nodes are always added to the top. Also note the curious way in which the addbranch attribute is used. For a start, it is write-only, and the effect of setting a value to it is to add a new branch to the currently selected node. By default, this starts out as the root (which is set using the name attribute) The id of the root is always 0; when we add "Birds", the new branch has id 1, again when we add "Crustaceans" the new branch also has id 1 - by which time "Birds" has moved to id 2, further down the tree. There is a corresponding function TreeGetUserId which accesses the table associated with the node id. There is also a function TreeGetId which will return the id, given the unique table associated with it. You can use this to programmatically select a tree node given its data by setting the value attribute to the returned id. We ignore '.' and '..' (the current and parent directory respectively) and check the mode to see if we have file or a directory; this requires the full path to be passed to attributes. This function returns two separate tables containing the names of the files and directories. for i = #files,1,-1 do -- put the files in reverse order! for i = #dirs,1,-1 do -- ditto for directories! By default, the directory branches will be created in their expanded form, so we use the STATE attribute to force them into their collapsed state. Normally you would say this in Lua like so state2 = "COLLAPSED" but here we build up the appropriate attribute string with the given id and use array indexing to set the tree attribute. This is why directories need to be specially marked, so we can tell later whether we have actually generated the contents of that directory! 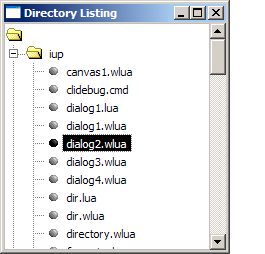 See directory.lua in the examples folder. Any application that can perform a number of operations needs a menu. These are not difficult to create in Iuplua, although it can be a little tedious to set up. The basic idea is this: create some items, make a menu out of these items, and set the menu attribute of the dialog. The items have an associated action callback, which actually performs the operation. The function create_menu does all the work; we provide it with a Lua table containing pairs of values; the first value of a pair is always a string, and will be the label. The second value can either be a function, in which case it represents an item to be associated with a callback, or nil, which means that it's a separator, or otherwise must be a table, which represents a submenu. It is a nice example of how recursion can naturally handle nested structures like menus, and how Lua's flexible table definitions can make specifying such structures easy. This useful function is available in the iupx utility library as iupx.menu. Many kinds of numerical data are best seen as X-Y plots. iup.plot is a control which can show several kinds of plots; you can have lines between points, show them as markers, or both together. Several series (or datasets) can be shown on a single plot, and a simple legend can be shown. The plot will automatically scale to view all datasets, but the default minimum and maximum x and y values can be changed. 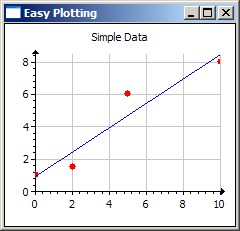 It is even possible to select points and edit them on the plot. A limitation of the plot library is that it does not choose appropriate sizes for the plot margins. So I've had to set the bottom and left margins (in pixels) to properly accomodate the axes and their titles. As with all IupLua attributes, you can choose to make them upper case if you like; a full list is found in the manual under Controls/Additional/IupPlot. Some of these attributes refer to the plot as a whole, some to the current dataset. For instance, setting GRID to "YES" will draw gridlines for both axes, but if we set DS_LINEWIDTH to 3 after the construction of the cosine dataset, then only that line is affected. Some attributes affect others. DS_MODE is used to specify how to draw the dataset; it can be "LINE", "BAR", (for a bar chart) "MARK" (just for marks) or "MARKLINE" (for lines and marks). But it has to be set before any of the other DS_ attributes like DS_MARKSIZE, etc. In another case, you will often find it useful to set an explicit minimum y value by setting AXS_YMIN. But it will only take effect if AXIS_YAUTOMIN has been set to "NO" to disable auto scaling. -- don't need to remember this anymore! -- the defaults for these values are too small, at least on my system! -- if we explicitly supply ranges, then auto must be switched off for that direction. -- is xvalues a table of (x,y) pairs? -- mode must be set before any other attributes! This function creates a Plot object as usual, but supplies some more sensible defaults for the margins, makes setting things like AXS_XMAX also set AXS_XAUTOMAX, and adds some new methods to the object. Of these, AddSeries is the interesting one. It allows you to specify the data in two forms; either as two arrays of x and y values, or as a single array of x-y pairs. It also allows optionally setting DS_ attributes, taking care to set the plot mode before any other attributes. In this way, the actual details can be hidden away from the programmer, who has then less things to worry about.